Gordon Gekko (Michael Douglas) wearing the Cartier Vendome Santos sunglasses in Wall Street. 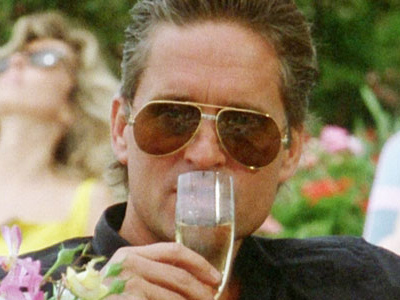 Michael Douglas wears Cartier Vendome Santos sunglasses in the 1987 movie Wall Street. The Cartier Vendome, a classic 1980s aviator frame, was available in different styles, including Laque (with lacquered nosebridge), LC (Louis Cartier, horizontally striped nosebridge), and the Santos (with three metal squares with gold screws. it looks like Gordon Gekko (Michael Douglas) wears the Santos model. In the sequel, Wall Street 2: Money Never Sleeps (2010), Michael Douglas wears a pair of Barton Perreira Halston glasses. In both the first and the second Wall Street film, Gordon Gekko also wears a wristwatch by Cartier, a gold Cartier Santos with white dial and Roman numerals. The same model glasses, Cartier Vendome Santos, was worn by Christopher Walken in the 1985 James Bond film A View To A Kill.